The Lemon Tetra is a member of Characoid family of fish and its scientific name is Hyphessobrycon Pulchripinnis. It gets its common name from its yellow tipped fins and its slightly yellow body. These fish originate from Brazil. They are shoaling fish which need to be kept in groups of at least five. In a large group they will actively swim around the aquarium, putting on a good display of movement and colour. However if keep alone they are likely to become lonely and depressed, in a similar way to how Clown Loach react to being alone. The stress of being alone will make them more prone to disease and infection. 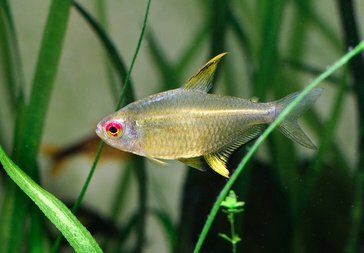 They are peaceful fish which make a good addition to the community aquarium; I would recommend putting them with other peaceful tetra of a similar size. These fish grow to a maximum of 2.5 inches and they like to live in groups of at least 5, therefore I would suggest a minimum tank size 60 litres. They are active swimmers so try to leave a large open space for them to spread their fins and enjoy themselves. You should also try to recreate their natural environment by planting lots of live plants. Ideally they prefer a pH of around 6.5 and you should aim to keep the water temperature between 23 and 28C. They will react to changes in the water quality, so regular water changes are necessary. They are eager little fish when it comes to food, although due to their small size they don’t eat a great amount of food they will normally be the fish to reach the food at feeding time. They accept and live happily on flake food, but as a treat you should also feed them live or frozen foods every now and then. Lemon Tetra particularly love brine shrimp and blood worm. They can be tricky to breed, if you haven’t bred fish before I would suggest you try an easier fish first. Some have been more successful by keeping more than one female with each male. These are egg scattering fish, so it advisable to move the fish you intend to breed to a separate breeding tank, otherwise there is a good chance the eggs will get eaten. You should include some plants in the breeding tank; I think Amazon Sword would be a good choice as it has nice broad leaves. If the female does spawn she will lay her eggs on leaves. Once she has finished spawning remove all the adults from the breeding tank, otherwise they will eat the eggs. The eggs should hatch after around 24 hours, but not all the eggs will hatch. To increase the number of fry which hatch keep the water within the fishes ideal parameters. Feed the fry brine shrimp or liquid fry food.